Unicorn Rainbow Tier Chiffon Cake, for my friend's very sweet daughter! I've made many Rainbow chiffon cakes, but this is the first time I tried one with even thickness across 2 tiers. I was really nervous but thankful it panned out well. The challenge is to estimate and scale, and also divide the batter correctly for different pan sizes. The scaling comes from experience and I've sharing a scaling index across different pan sizes at the back page of my 2nd book Deco Chiffon Cakes. 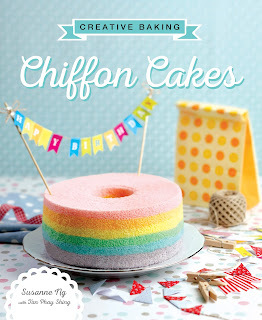 Recipe for 6-colour Rainbow chiffon cake is in my 1st book Creative baking: Chiffon Cakes; it's on the cover of the book. 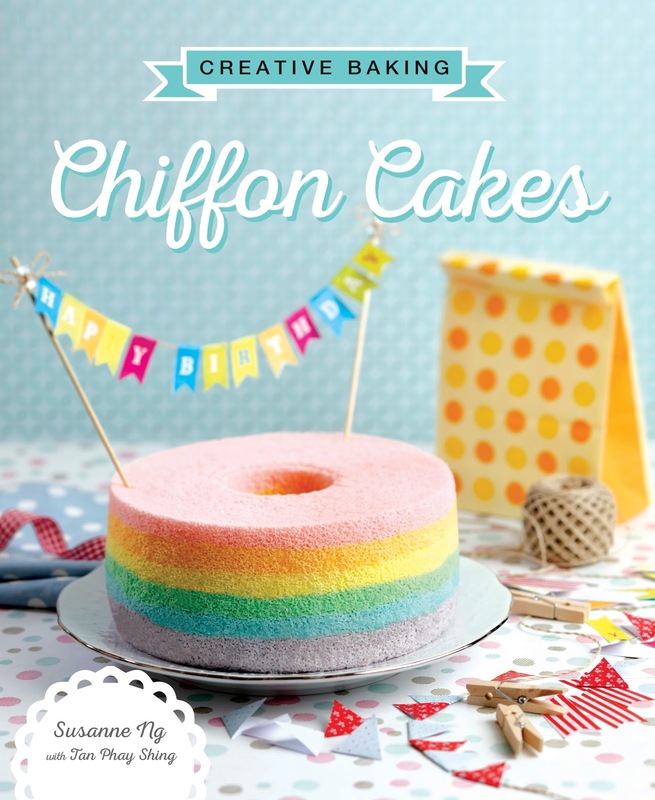 Very happy that the Rainbow chiffon cake has been trending Singapore and Asia since the release of the book! Recipe for the Tri-colour chiffon cake is below for you to try. It's a 4 egg recipe unlike the Rainbow chiffon, and uses a moister base formula. Do tag me if you try! Will love to see. 1. Preheat oven to 160°C. Prepare a tray of water at the bottom of the oven (I used the lowest rack to bake the cake). *You may omit steam baking; I like to use it for moister cake. 2. Beat egg yolks with sugar with whisk till light before stirring in oil, milk/water and vanilla extract. 3. Add in sieved flour and whisk till no trace of flour found. Divide the batter into 3 parts. Add respective wilton or food colouring. 5. Divide the meringue into 3 parts for each of the 3-coloured egg yolk batter above. Gently but quickly fold in the meringue into each batter 1/3 at a time. 6. Spoon the pink batter into the chiffon tin evenly, followed by the orange batter, and then lastly the yellow batter, leaving around 2 cm from the tip. 8. Bake the chiffon cake for 15 min at 160°C and then at 140°C for 30 min. For the 9-inch pan, it's divide the recipe by 4 times 7. 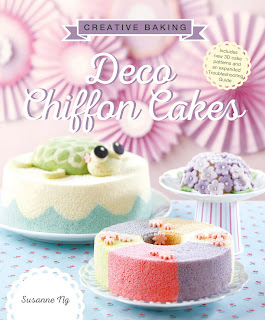 The unicorn is also diy from chiffon cake! 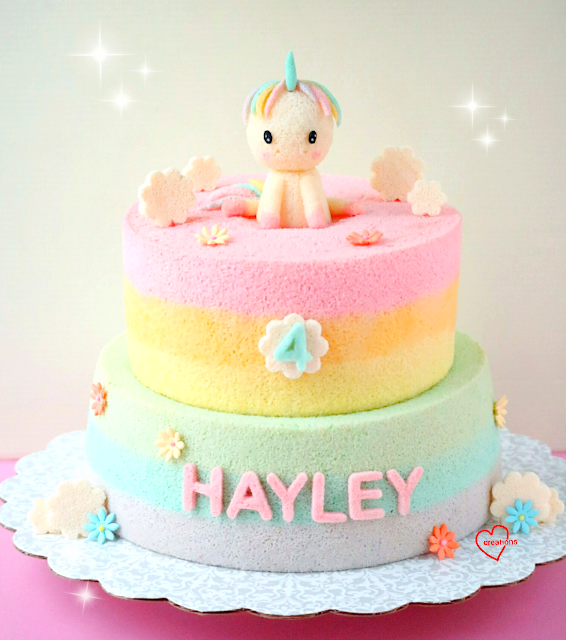 It's different from my other two versions of unicorns, and the hair is cut from strips of chiffon cake! You can imagine the work (and work of love involved =p). Briefly, I joined chiffon cake from an egg shell to chiffon cake from cone, and arms and feet are from swissrolls. Have a sweet week ahead! In addition to scaling guide, Deco Chiffon Cakes also has an extended 6-page troubleshooting section for basic and deco chiffon cakes (not in the 1st book). Hope these will be very helpful to those attempting chiffon cakes. Hi, it is a very nice cake. Thank you very much for the recipe. One question though, how do you cut out the letter? Do you use cookie cutters for that? Thanks! How do you equate the eggs to grams and as well as the cream of tartar? By the way, can I bake the cake in a normal pan with a removable base? Hi! Egg whites can round up to 9 egg whites. Water round up instead of rounding down (102g). Cream of tartar: around less than 1/2 tsp. Yes you can bake in a normal pan, but baking time will be longer and you will need to scale up to times 8 as the volume is bigger. Thanks! Thanks! How would you equate the following to teaspoons? By the way, can I use things like strawberry or blueberry pastes in lieu of vanilla? Would it be the same quantity? Hi yes you can. Sorry for late reply! totally didn't get any notification. Thanks! Hi! I tried baking it in a 10" pan with the recipe for the 9". However, despite baking for a longer time, the middle part doesn't seem to cook that well. Also, my cake unmolded by itself! Any idea why it happens? It sounds like the cake is underbaked. Because the oven's internal heat and design is always different. Good to check with bamboo skewer in the middle first before stopping. Thanks!